I already featured a unique 10 centavos ERROR in a previous article on this site. It’s a combination of impossible sequence of error that a simple explanation cannot be satisfied by the coin itself. On this issue, the same kind of sequence of errors again appeared in the 5-centavos denomination. It appears that the coin was first struck in 1966 and then the following year of 1967. Surprisingly, the coin was struck using only both reverses, the first one came from the regular issue from the last REPUBLIC coin dating 1966, and the second one from the 1967 of the first PILIPINO series. Yet the oddities doesn’t stop there, it appears that the 1966 reverse came from a 10 centavo denomination considering the diameter of the legend, while the second reverse from the 1967 came from the regular 5-centavo issue considering otherwise the diameter of the legend which is almost the same in proportion with the 10 centavo denomination from the REPUBLIC issue. Then, there is the planchet to add further confusion which is by measurement seem small for the two dies simply because it was from a 1 centavo denomination host coin therefore, making the coin a triple denomination (10 centavos, 5 centavos, and 1 centavo), a mule where both reverses came from two different values (10 centavos and 5 centavos), two tailed since both are made-up of two reverses, multiple struck, off-planchet since the normal planchet for the 10 centavos is copper-nickel while brass for the 5-centavos, off-center, and the dies rotated. But by far, only half of the scrutiny was reached since the coin again was struck for the third time in 1983 as the first issue for the FLORA AND FAUNA series was inaugurated. So, it only means that the coin is otherwise triple dated (1966, 1967, and 1983). 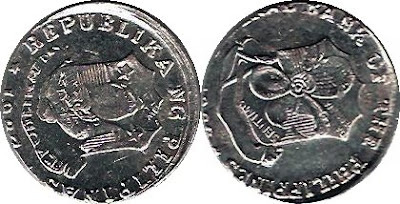 Amazingly, those dates are historical since it was either the beginning of change or the end of an era for a coin design, perspective, and regime thereby making this coin by far the only documented triple denomination coin and triple dated coin in the history of Philippine numismatic and possibly in the world of numismatic itself. Meron din po akong 1 peso na nagkaroon ng error,2017 one peso coin.Tabingi po at walang groove sa gilid.